The Good Friday Agreement marked a historic shift in politics on the island of Ireland and put in place a firm foundation from which it is possible to continue building the peace process. For the first time since partition, almost 100 years ago, there is an international agreement involving the Irish and British governments, as well as nationalist, republican and unionist parties on a way forward. This includes power sharing political institutions which have the support of the overwhelming majority of citizens. The GFA tackles constitutional issues, political and institutional matters, policing, weapons, justice and equality, and more. Subsequent agreements at St. Andrews and Hillsborough built on this progress. However, not all aspects of the Good Friday Agreement have been implemented and outstanding issues like flags and emblems; the legacy of the past; parades; equality and the status of the Irish language, as well as culture and identity issues have continued to bedevil the process. This time last year Belfast witnessed rioting as loyalists attacked the PSNI, the nationalist Short Strand area; and held illegal demonstrations demanding the right to fly the Union flag whenever and wherever they wanted. This issue and protests over orange parades have placed a significant strain at times on the political institutions. For that reason and because all of these difficult issues are not going to go away the First and Deputy First Ministers - Peter Robinson and Martin McGuinness - invited U.S. diplomats Richard Haass and Meghan O Sullivan to come to the north and to chair an All Party Group to ‘consider and make recommendations on matters including parades and protests; flags, symbols, emblems and related matters; and the Past’. But despite a succession of amended draft proposals from the two US Diplomats the talks failed to reach agreement. There was a real sense of public disappointment at that outcome, which Sinn Fein shared. Progress had been made and the Sinn Fein negotiating team believed that agreement could be reached. Unionists indicated that they had serious problems with important parts of the proposals. 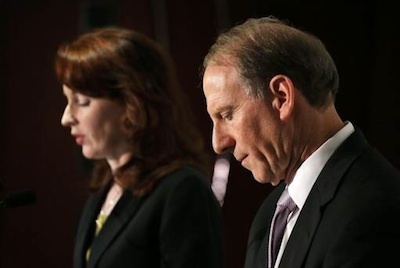 However, Richard Haass and Meghan O Sullivan agreed to return for one last push between Christmas and New Year. The negotiations recommenced only to conclude after 5 am on December 31st without agreement. By that stage we had reached the seventh draft of the Haass proposals. Some in the media interpreted this as an abject failure. It wasn’t. The process has not concluded. The Haass proposals have now to be brought to each of the five party leaderships by their negotiating teams. It is up to those leaderships to decide whether the proposals offer another step forward and what should happen next. In my view significant progress was made and in particular on two of the three issues - Parades, Select Commemorations and Protests; and Contending with the Past and the proposals produced by Dr Haass and Meghan O’Sullivan do provide the basis for an agreement. Of course, like every negotiation the document that has been produced is a compromise position. Sinn Fein would like to have seen some aspects strengthened and improved further. However agreement on everything was not possible. This is particularly the case on the Flags issue. Like others we have little confidence that the proposed Commission on Identity, Culture and Tradition will resolve these issues. We nevertheless welcome the potential of this process for further mainstreaming parity of esteem and equality. I was also disappointed that issues like Acht Na Gaeilge and the development at Maze/Long Kesh which were part of previous agreements, were not advanced. They remain to be resolved in the time ahead. These issues are not going away. Much more work is required on parity of esteem, equality and respect for all cultures and identities. Sinn Fein has consistently advocated direct meaningful dialogue as the best means of resolving the few remaining parading disputes. In the absence of dialogue or a failure to reach agreement over contentious parades there is an obvious requirement for a robust regulatory body. The proposals contained in the Haass paper meet that demand. And over a decade ago Sinn Fein proposed the establishment of an Independent International Truth Commission. In our view that remains the best option. But a basis for compromise on this issue has been proposed. That is what the majority of our people want. Closure for victims and survivors is the real benchmark against which this proposition will in time be judged. It is a fact that the issues of parades, flags and emblems and the legacy of the past cannot be ignored. They are too important. There is an onus on the Irish and British governments and all of the parties to maintain the momentum that was created in recent weeks and to build on the progress achieved. To this end I called for all of the parties not to fudge their response to the Haass proposals. I called for clear statements of support. Regrettably the Ulster Unionist Party and the DUP have decided not to support the proposals. The difference between these two parties is purely tactical. The DUP said more work needed to be done to the proposals and called for an all-party working group to be established while the Ulster Unionist Party has rejected the Haass proposals as neither ‘viable or acceptable’. Two slightly different ways of Ulster Saying No! With Peter Robinson taking a slightly more nuanced position than Michael Nesbitt. Beag an difir. Irish Republicans have stretched ourselves in the negotiations and we are up for the challenge the Haass proposals contain. The Sinn Fein Ard Chomhairle of the Party will meet this Saturday to review the outcome of the talks process, and agree our response. This is a time for political leaders to lead. Unionist leaders are failing their constituents and ignoring the clear desire by the vast majority of citizens who want to see agreement on these outstanding issues. The Haass paper can aid this project. I would urge anyone interested in the future to access it online, and read and consider the proposals it contains.